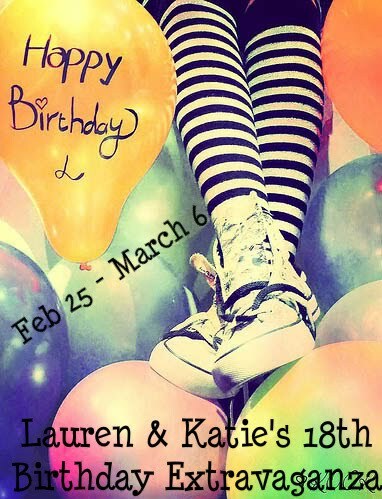 Can you believe the ten days of Lauren & Katie's 18th Birthday Extravaganza have already passed!? We both have had so much fun during this entire event and would like to thank everyone for helping us celebrate our eighteenth birthdays. A huge thank you goes out to all of the amazing authors that participated! The guest posts were absolutely incredible! Also a big thank you so the publishing houses that donated some of the books! Thank you to Momo from Books Over Boys for making our flat out adorable buttons! I also want to thank Lauren for hosting this with me, she's such a sweetheart! Her guest post buttons were just fabulous and she's so generous with donating her own books to the event! Thank you so much Lauren! This was a complete joy to do and I hope you all had as much fun as I did! Thank you! Here's a recap of all the events! 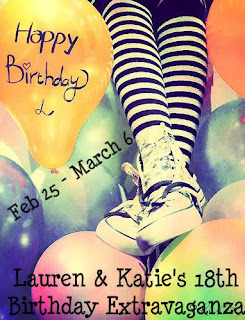 The bold events were posted here, at Call Me Crazy and the unbolded events are over at Laurens blog, 365 Days of Reading! Wow, what a great way to celebrate your birthday and adulthood! Hope you had a good one! even though I didn't comment in a lot of posts, I did read them all, and I just loved the idea of authors writing to their 18 yea old selfs! congrats to bot you and Lauren! I loved all the Birthday Posts. Great way to have a celebration!